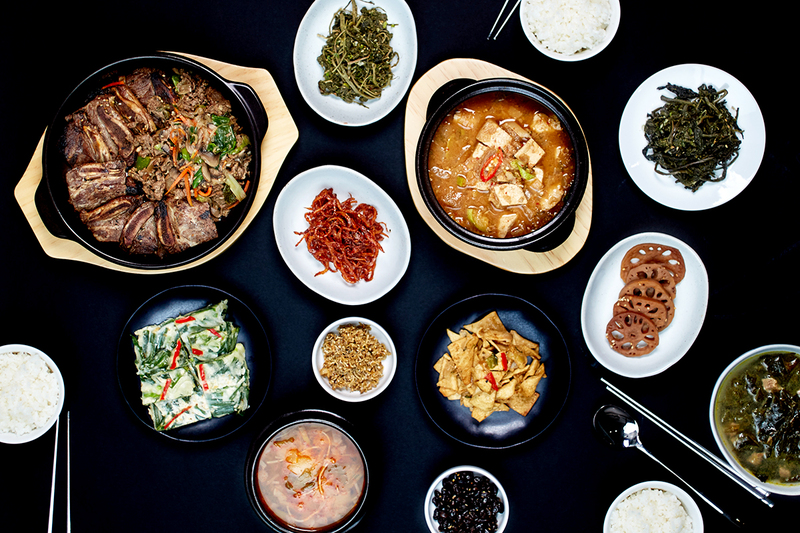 There's no denying that Korean food has made its mark on the American food scene, particularly in the last 5 years. Kimchi, once an obscure side dish, is now available in major supermarkets and local bodegas. Korean BBQ restaurants, with their fiery table grills and platters of meat, are popping up in city after city. As some of these Korean foods become more familiar and inspire fusion experiments (kimchi quesadillas are "a thing"), it begs the question: How do Korean people really eat? What are the hallmarks of this dining culture? Here, we offer a brief primer on some of the most essential dining elements in Korea — foundational practices and other miscellaneous methods that distinguish it from Western cultures. The heart of traditional Korean dining is communal. You won't find structured courses or progression from one part of the meal to the next. Think of this as an orchestra instead of a series of soloists. Dishes are set out simultaneously and shared amongst the guests. There is great effort made to integrate a variety of colors, textures, and flavors. And while there are no fixed patterns, harmony is essential. That's why rice (bap) is the drum in this ensemble — the starchy, neutral grain holds the beat for the rest of the meal. It's sacred. Though the occasion and personal preference both play a role, on a typical table you'll find rice, a main protein, a soup or stew, and anywhere from two to ten side dishes, one of which will always be kimchi. 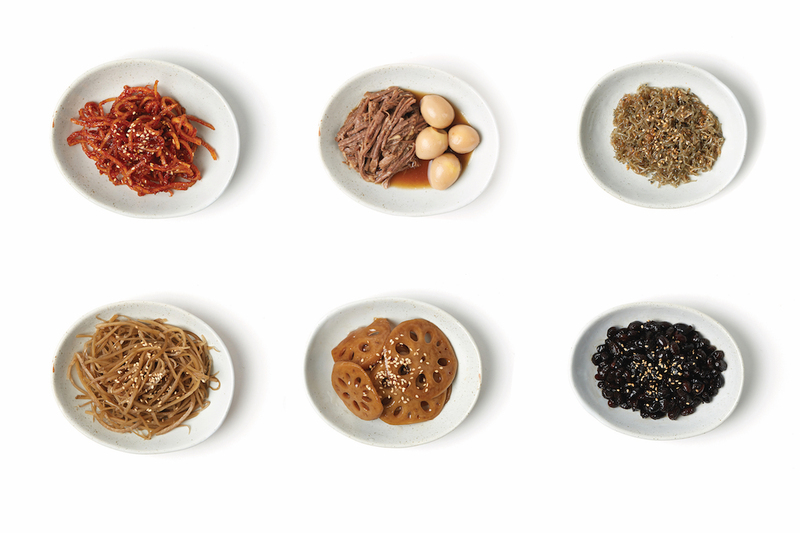 In Western culture, it's common to have meals organized in a protein-starch-vegetable structure, but on a Korean table, it's not uncommon to see multiple proteins in various serving sizes. In other words, if pork bulgogi is the central protein, there might still be a smaller portion of a fish or beef dish somewhere on the table. It's better, in fact, to think of "mains" as slightly larger sides. The big thing to remember is this: The dishes aren't for eating one by one. Take a bite of rice. Follow that with one or two bites of banchan. Then another bite of rice. Mix and match. Enjoy a flavor, take a break, and then come back to it. 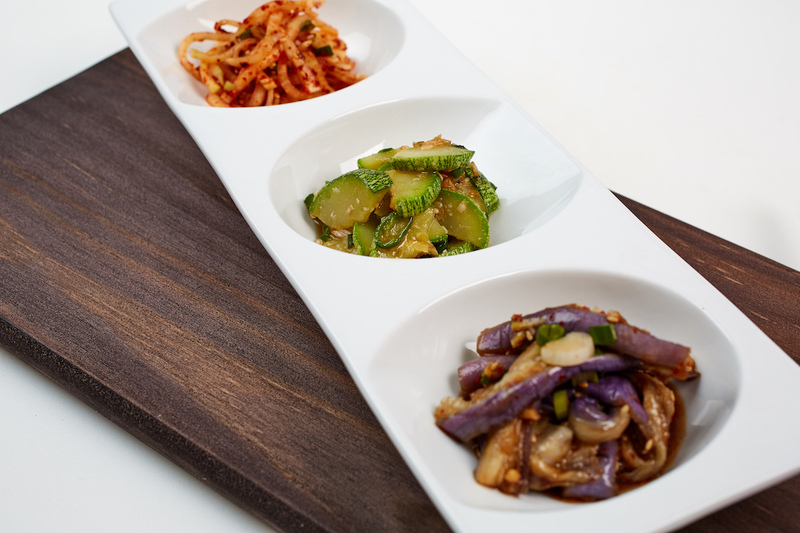 Banchan: Banchan translates to "dishes that complement rice," but the translation is often simplified to "side dishes." These side dishes are what accounts for Korean dining — all eaten in small bites and shared amongst people at the table. Kongjaban: Braised black soybeans are a staple. Salty, sweet, and a little nutty. Musengchae: Spicy seasoned radish that will cut right through the savory grilled meat on the table. Buchuhjeon: Garlic chive pancakes that may erase your memory of sweet pancakes. Dubu Jorim: A recipe that turns tofu's blank canvas into a bright and vibrant work of art. Gosari Namul: If you've never had fernbrake before, a good way to experience this vegetable is covered in soy sauce, garlic, and sesame oil. Hoback Namul: The pan-fried zucchini gets a welcome and wonderful kick from shrimp fish sauce. Gaji-Namul: Forget eggplant parm for a moment. Steamed and seasoned eggplants are doused in a bright, vinegary sauce just before serving. Preservation is a central part of Korean culture. To survive the winter, Koreans developed ingenious storage methods for food. What's important to note, though, is that these methods did more than just prevent food from rotting — they revealed how food can get better by getting older. Kimchi is the world-renowned dish that best epitomizes this idea, but other items, like dried squid, also showcase the importance of preservation, and how it can lead to new flavor profiles and thus new dishes. It's not just about saving — it's also about invention. Dessert is not a "thing." Yes, there are sweet Korean dishes, but desserts are generally thought of as snacks. You won't be handed a dessert menu at a restaurant, and there isn't a specific time for desserts to be consumed in relation to a meal. If something sweet comes at the end of dinner, it will be fruit, always peeled. But even that is not considered essential. Stews are shared, but soups are not. Soups are typically served in smaller individual bowls. Stews, which tend to be heartier and saltier, are served in larger bowls and are normally not transferred to smaller ones. (Yes, that means a lot of double-dipping, but there are still etiquette rules below. Make sure your spoon is clean!) A particularly hearty stew can even be a main dish. Rice is not a dumping ground. It's normally taken in separate bites from the banchan. Don't top it with five different sauces and stir it into a mess. A lot of care and investment is put into each of those grains. Take the time to appreciate them. Speaking of rice, you'll notice that the bowls are not filled with mountains of rice. The rice tends to lay flush with the edge of the bowl. Be mindful of others. Small bites! No hogging bowls! Sharing doesn't mean cross-contaminating. Even though the dining experience is communal, chopstick control is crucial. When you reach into the bowl, you should make a targeted pull without touching too much surrounding food. Chopsticks are not for stirring, especially when you've already taken a bite with them. Don't leave any utensils in the rice bowl. They should go on the table after eating. Though no one will kick you out for using chopsticks, rice is meant to be eaten with a spoon. Leave the rice and soup bowls on the table. Tempting though it might be to pick up your bowl and take a big slurp from the side, resist the urge. Before eating, it's customary to tell the person who prepared the meal, "jal-meok-get-seum-ni-da," which means, "I will eat well." It shows appreciation and respect for the food. Make use of the spoon and chopsticks. Don't eat with your bare hands, unless you're eating ssam or a street food. Take your time. When a meal is made with care, it's nice to pace yourself, and savor.